Inspiring Ideas with artist Jeanne Winters: Happy Birthday, Jesus!!!!! Happy Birthday, Jesus!! Our flourless chocolate cake covered in two coats of ganache ... decorated by my two sweet babies!! Merry Christmas, everyone!!! Be blessed! 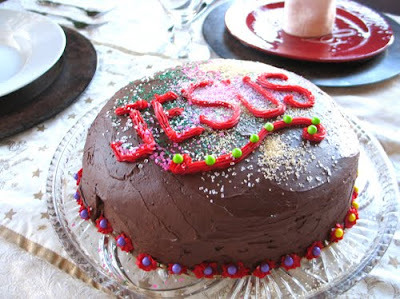 What a beautiful Jesus birthday cake. I wanted to stop by and wish you a wonderful Christmas. Your name came up today as I had my husband's family over to our house. One of my nieces is very creative and artistic. I told her about you and your book and how many of your products are sold by Hallmark. She was so impressed. I also recommended she check out the Etsy shops. I do believe you are so talented. I just stumbled onto your blog from the in courage site... Thanks for sharing your gift of creativity! Merry (late) Christmas! Beautiful Cake! 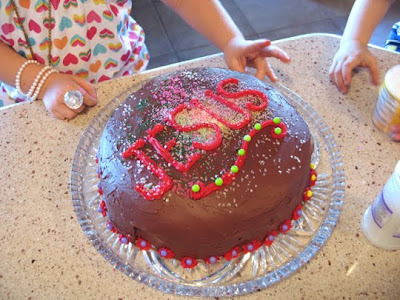 It's good to know that I'm not the only person who made a "Happy Birthday Jesus" Cake. I love your Jesus cake. We had one too. Stopping by from SITS!